The Department of Plastic Surgery and Hand Surgery at the University Hospital Rechts der Isar Munich offers the full range of services in the field of plastic reconstructive, aesthetic surgery and hand surgery. The doctors of the department have a unique experience in the field of tissue transplantation, finger, arm and hand replantation, as well as perform all types of classical aesthetic procedures. Thanks to the high rate of successful treatment results, the department enjoys an excellent reputation both in Germany and far beyond its borders. The department is headed by Prof. Dr. med. The medical team of the department consists of 16 highly qualified doctors, who make every effort to achieve the best functional results, taking into account the aesthetic aspects. Surgical interventions are performed in state-of-the-art operating rooms, equipped with all necessary technical facilities. Outpatient operations are performed in a separate outpatient operating room. To provide medical care in case of urgent clinical situations, a specially trained team of doctors works round the clock in the department. Since 12.2007 and until now, Head of the Department of Plastic Surgery and Hand Surgery at the University Hospital Rechts der Isar Munich. 11.2003 Visiting Professor (University Hospital Lubeck). 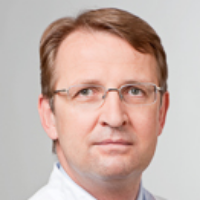 10.1999 - 11.2007 Senior Physician (since 02.2004 Leading Senior Physician) of the Department of Plastic Surgery and Hand Surgery at the University Hospital Lubeck. 11.2002 Additional qualification in hand surgery. 10.2001 Optional advanced training, intensive therapy in plastic surgery, including medical care for severe burns. 02.1999 Medical Specialist in Plastic Surgery. 08.1997 - 09.1999 Senior Physician of the Department of Plastic Surgery, Hand Surgery and Reconstructive Surgery, Hannover Medical School. 12.1996 Additional qualification in plastic surgery. 04.1995 Medical Specialist in Surgery. 06.1993 - 07.1997 Assistant Physician, Department of Plastic Surgery, Hand Surgery and Rehabilitation Surgery, Hannover Medical School. 03.1991 - 06.1993 Assistant Physician, Department of Abdominal and Transplant Surgery, Hannover Medical School. 08.1988 - 02.1991 Civil Service Physician and Assistant Physician (since 04.1990), Department of Surgery, University Hospital Heidelberg. 06.1988 Admission to medical practice. 10.1981 - 06.1988 Study of Medicine in Hannover, Göttingen, Heidelberg, Wuhan (China) and Chicago. Department of Plastic Surgery and Hand Surgery.